Score both sides of the fish before seasoning lightly with salt. Add some garlic and ginger to the base of the serving dish before laying down the fish. Top the fish with more garlic, ginger, red chili and sesame oil. Add the fish to the oven to steam for 15 - 20 minutes or until the meat begins to flake off the bone. While the fish is steaming prepare the chili soy dressing by combining the ingredients together mixing until the honey is dissolved into the sauce. For the crispy ginger: heat the oil before adding the matchsticks of ginger and frying until golden brown. Add to absorbent kitchen paper to drain off any excess oil and cool to crisp. Drizzle the chills soy sauce over before topping with the crisp ginger. 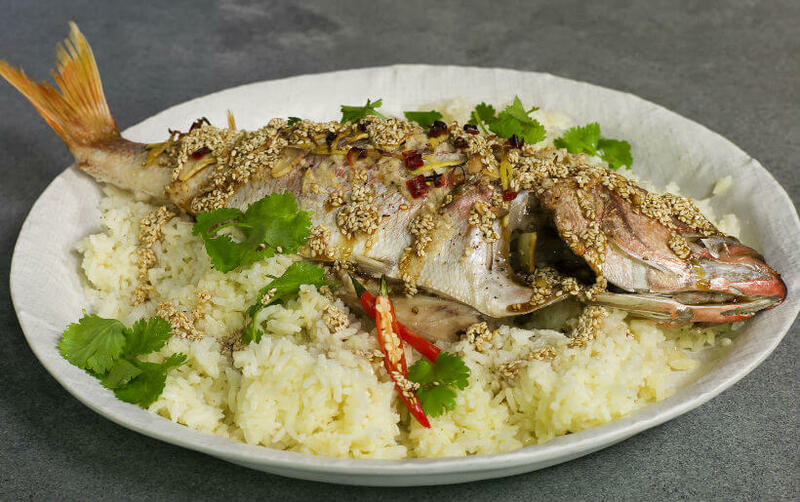 Serve the fish with sticky rice.